In the artist spotlight this week is the talented artist Christopher, discussing his art, inspiration and how his creativity helps him make friends and build relationships! 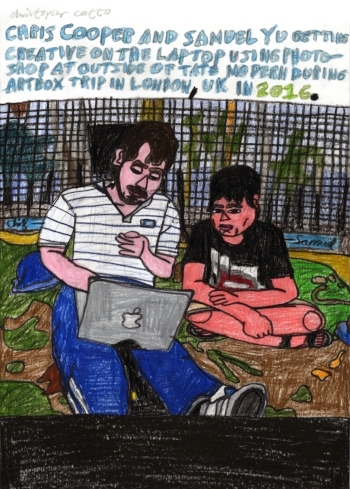 Artbox London: Can you tell us about your art? Christopher: My art is drawing. I draw pictures of people like celebrities, family friends, people I meet, characters from films and television, members of the Royal Family etc. Lately I been looking for more inspiration and I been drawing landscapes and cityscapes from photos that I take, photos people sent me and postcards that I buy in markets and charity shops etc. The materials I use are pencils, coloured pencils, thick pens to do the lines and thick cartridge paper which I like because it makes the colours really strong. Christopher: I always liked drawing when I was little but I became really interested when I was at a Residential School near Brighton and my teacher suggested I do some drawing to cheer me up when I was missing home. Artbox London: What inspires you? Christopher: Drawing pictures of people which I send to them to see what they think of it and then we can have a conversation about it and I can keep in touch with them. Artbox London: What does creating art mean to you? Christopher: Creating art makes me feel comfortable and calm as it's one of my calming strategies from when I am feeling stressed. It also helps me make friends with people and keep in touch with my friends. Artbox London: What kind of art do you like the most and why? Artbox London: Is there a particular piece of art or an artist that you enjoy the work of? Christopher: The artists I like are Roy Litchenstein, Andy Warhol etc. Artbox London: Is there an achievement that you’re particularly proud of? Christopher: Selling my work - also I won 4th prize in The Hoffman Autism Art Prize in 2009 and I like it when people tell me that they like my work. Artbox London: How does art make you feel? Christopher: It makes me feel relaxed and calm and helps me to concentrate. Art is my favourite hobby and draw all the time when I'm at home.